As a huge fan of the network and sports in general, it was a great opportunity to work with ESPN on the redesign of their website. For almost a full year, I worked with a massive bi-coastal hybrid team of designers, writers/editors and UX designers while being fully immersed in sports culture. 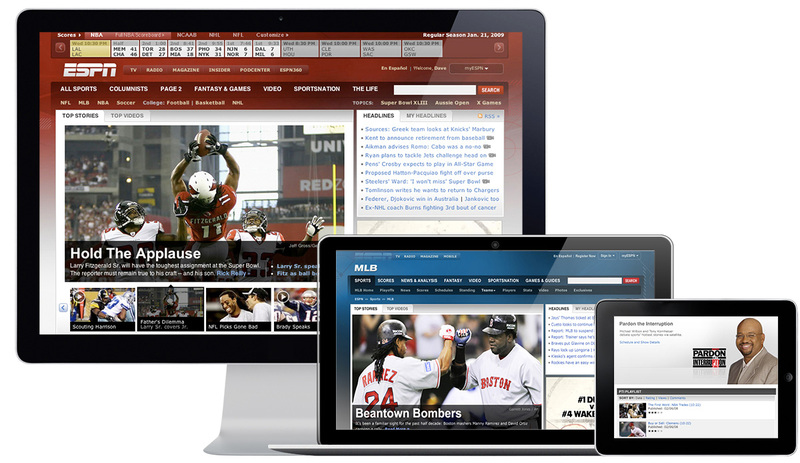 The key objectives for the redesign were to better integrate the ESPN empire through the digital space, and provide greater flexibility for the editors and advertisers to deliver time-sensitive news stories in more creative formats. 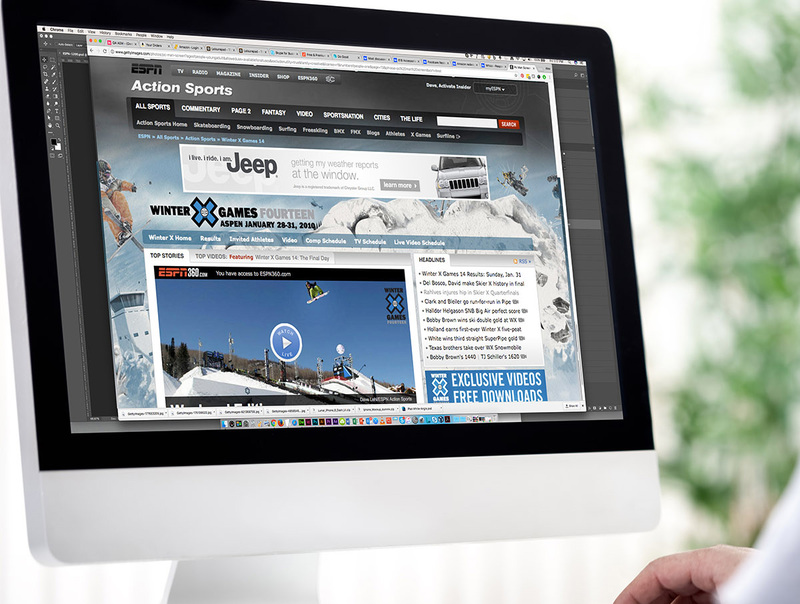 The multiple-award winning site that went live employs a 'fan-first' content strategy which provides easy access to scores, headlines, schedules and other key drivers of fan loyalty. With our template and component system, the site experience feels consistant and intuitive to the user, while ESPN's design team has the creative flexibility to organize content and tell stories in a variety of ways. The backbone of the design system, the background art and iconography, has been adopted into the ESPN brand as its found its way into the magazine, mobile APP, and many other products. 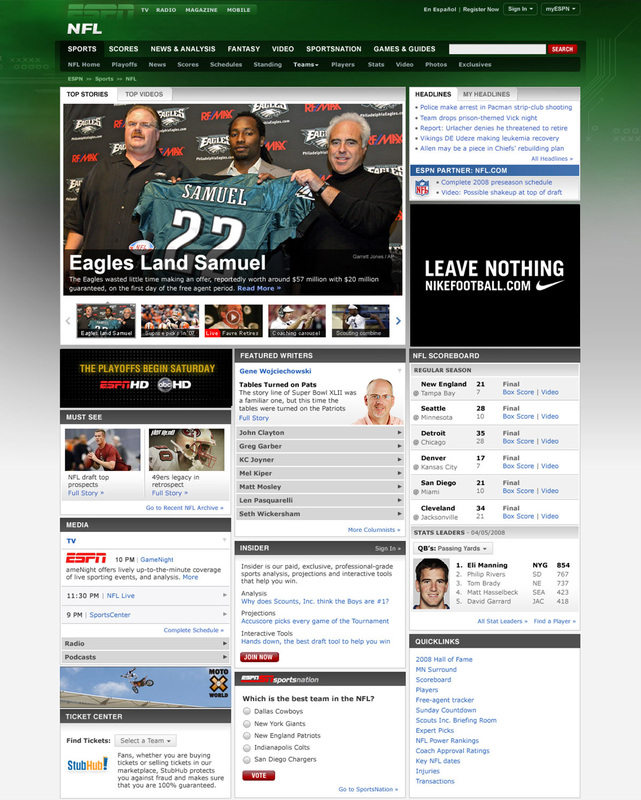 Justifiably, the most important page of the site, the ESPN homepage needed to be super flexible with regards to promotions, storytelling and media placement. 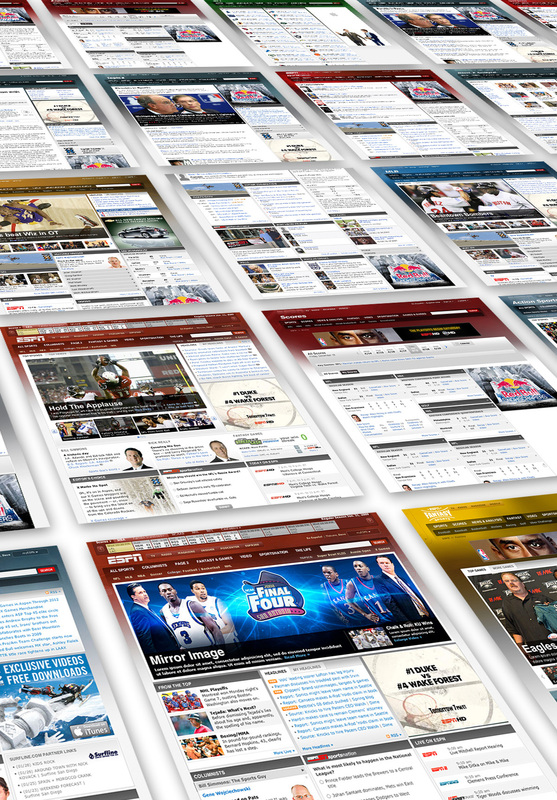 Beyond the homepage, we designed an entire galaxy of other pages and experiences. Template-driven components and blades could be quickly and efficiently swapped in/out by the editors and offered great flexibility to the designers and advertisors. One of my fondest contributions to the ESPN design system was my work on background illustrations. This design study included the creation of a color pallet and a library of custom vector illustrations - all of which are still in use to this day. 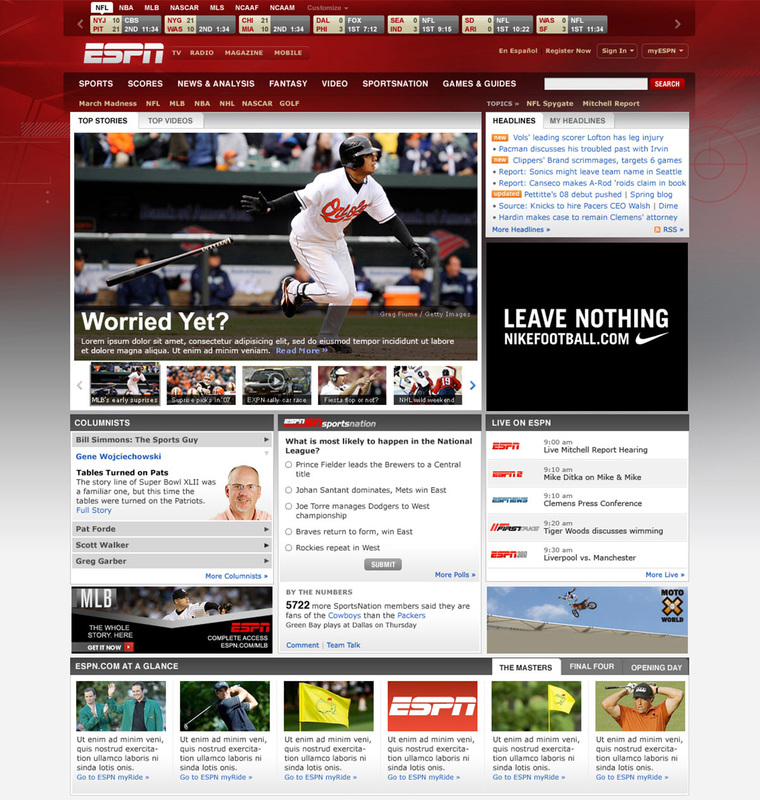 The redesigned ESPN.com (live until mid-2015) won an OMMA Best In Show for Website Excellence, a Webby for their Sports category, and another Webby as the People's Voice Winner. 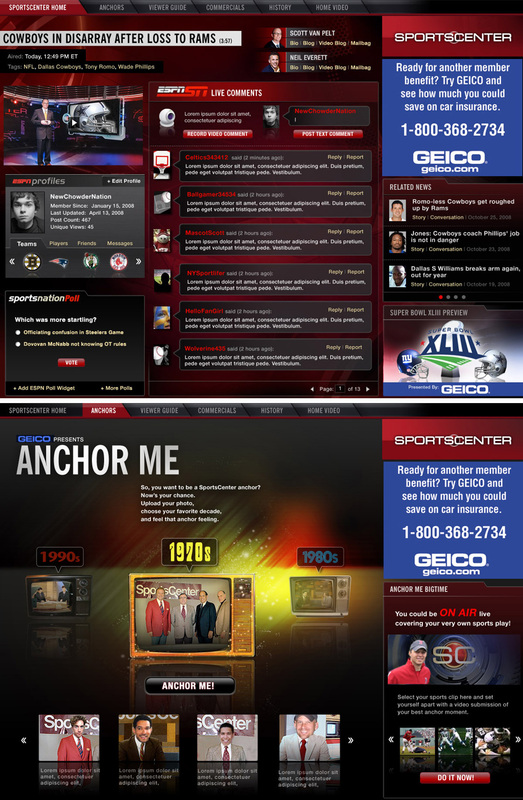 After Redesigning ESPN, we pitched a few additional concepts. 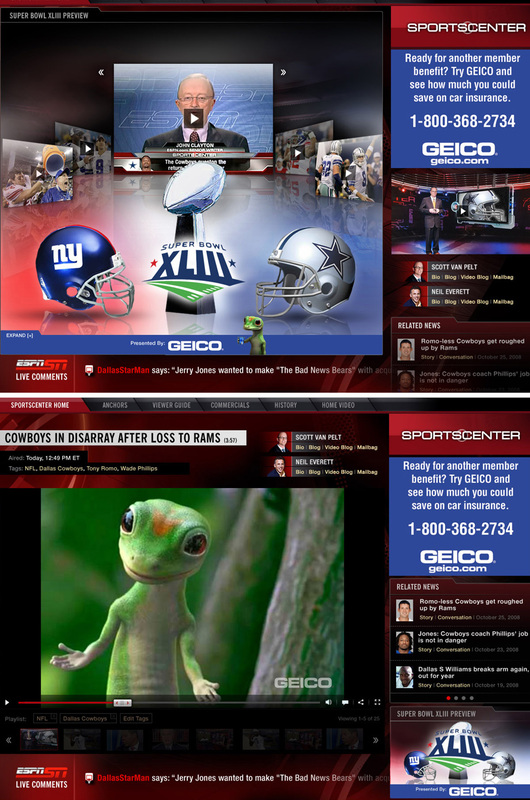 This one for Sportcenter leverages the untapped equity of the Sportcenter brand and brings the personality and playfullness of the show into the digital space. Stemming from this idea, my proposal for the microsite employs a liquid layout that enables the various sections, windows, news stories, and multimedia content to collapse and expand in a fluid manner, either on their own or by user initiation.